These are the last two weeks of my deployment to the Headquarters of the International Security Assistance Force (HQ ISAF) in Afghanistan. I will leave three days after the British have taken over from the Italians who have reigned this HQ for the last nine months, supplemented by people from other nationalities, such as Dave, a Brit who is one of my air transport planners, and myself. I am the NATO Chief air and ground transport and I am Dutch. Half of our ‘Italian’ crew have already returned home as has Carlo, our excellent Spanish boss. He is replaced by an English Army colonel, a stately man in his fifties with quite a belly and a double chin. He speaks the Queen’s English and likes order and tidiness. For three days, his attempts at cleaning his new office are the talk of the town. Everyone in the building passes by his open door a couple of times a day to see him fighting the room. And granted: after those three days the room had been transformed from Carlo’s paper-and-files-filled-chaos into an almost empty office. It has a bare desk with an office chair with five functioning casters (where did he get those?) and a simple chair to sit opposite him. Should he have kept any of Carlo’s papers during his tidying mania, they must have disappeared into the low, grey cupboard with an illustration of a tank hanging over it. Not that it is very likely that he has kept anything: something that was produced during a previous ISAF mission by a non-Englishman can hardly be relevant. He has put up curtains, organised internet access in his room and every morning the Financial Times is delivered to his office with which he spends the first hour of his working day. I am surprised by the internet access. HQ has only limited availability of Internet, based on operational necessity. Our logistics department already has two internet computers: one in my air transport room and one in the petrol room. The Spanish colonel always used the one in the petrol room, but apparently that doesn’t befit an English colonel. After ignoring us for three days while straightening out his room (kudos to him) he sends for me. ‘Oh, oh,’ William mutters when a corporal informs me that the colonel would like to see me now. ‘Why, oh, oh?’ I ask. ‘When the colonel asks “to see you now”, it means trouble,’ he says in a grave voice and hides away behind his computer screen without making eye contact. Last week, William replaced Mario, the Italian major. William is, as I am, an outcast in this now, two weeks before the takeover, almost entirely British system. He is British Air Force and air force personnel are somewhere at the bottom of the caste system of the British Army. Below worms and other molluscs, but significantly above foreign army personnel, or, even worse, foreign air force personnel such as myself. But as a fellow air force man he is apparently closer to me than to the British Army and we are on very good terms. ‘It’s best to agree with everything he says, that is the fastest way to get rid of him,’ William says. In my mind I review the last few days: did I do something wrong? I can’t think of anything. Being nonetheless slightly nervous after William’s comments, I walk to the room next to ours. The door is closed. I knock three times. No response. Is he deaf, is he on the phone or is this an intimidation tactic? I wait five seconds, just as I was taught fifteen years ago as a new cadet at the military academy. The memory makes me smile. Then the memory immediately changes into an unpleasant feeling in my stomach. That protocol also required a military salute in front of the desk. How formal are the English, am I supposed to salute the colonel in his office? I have never done that: in the Netherlands we don’t salute anymore, and the Italians and the Spanish never insisted on protocol. I rack my brain trying to remember how it should be done. Something to do with walking up to the desk and stamping your feet together. No, that can’t be right; The new Dutch drill no longer incorporates stamping as that does not comply with Health and Safety regulations. Then I firmly tell myself: stop this nonsense, just follow normal Dutch protocol. A ‘good morning colonel, I am lieutenant-colonel Kleinreesink, you sent for me?’ with a pleasant smile should suffice. Once again, I knock three times on the door, this time so loudly that nobody could possibly ignore it. After waiting another five seconds, I slowly press down the handle, swing the door and gingerly insert my head into his office. A stern ‘yes’ comes from the five caster chair. Ah, he is reading his newspaper; clearly intimidation tactics. I walk forward and halt next to the visitor’s chair that is right in front of the desk, say the rehearsed sentence and extend my hand with a friendly smile on my face. An unfriendly face topped with grey hair looks at me and then at my extended hand. For a moment everything remains silent. Maybe saluting would have been better. Then he shakes my hand. I expect a ‘please be seated’, but when that doesn’t come, I remain standing like a schoolgirl in front of a cross teacher. To prevent any awkward fiddling and to compensate for the previous lack of military protocol I remain at ease: legs spread and hands folded on the back. With some jealousy I see that his workspace is the acme of clean desk policy. Apart from one lamp, one computer and one copy of the Financial Times, it is empty. He has put the telephone on the radiator behind him and even an in-tray is missing from the desk. Out of the corner of my eye I spot the in-tray on the low cupboard below the picture of the tank. Also empty. On the newspaper lies a thin pile of printed A4 paper that I recognize as the order for the takeover ceremony that will be held in two weeks. Ah: at least he knows his priorities. Apparently there won’t be any ranting and raving about any real problems such as the lack of available aircraft, and my colleagues from the petrol desk don’t need to worry about surviving a cross-examination about the available oil supplies in Afghanistan. Seeing and being seen by the officials during the takeover ceremony obviously has the highest priority with this colonel. ‘Did you assign the people from the logistics department for the takeover ceremony?’ he asks in a harsh tone. ‘Together with Paul, the deputy,’ I say. ‘I will not put any officers in the hot sun for hours during a ceremony, when there are non-commissioned-officers such as your warrant officers sitting comfortably in their office,’ he says. The room remains silent. I am astonished. ‘Sure enough, you can to a British Army officer,’ he says, emphasizing ‘British’ and ‘Army’. He looks at his newspaper and it is clear that the conversation is over. He shakes his head. ‘Your major will also attend the ceremony. Make sure that one of my British lieutenant-colonels from the petrol desk is briefed,’ he says, followed by an impatient ‘thank you’ when I make no attempt to leave. After this conversation, I walk into the air transport room and close the door. Both warrant officers look surprised: I never shut the door. ‘I don’t want to go to the TO and besides, that is not possible ‘cause it will leave the desk unmanned, ma’am,’ Dave says. ‘Then who will man the phone?’ Dave asks in an impatient tone. Dave now looks just as astonished and furious as I feel. For a moment I doubt whether I, as an officer, should point out to Dave that it is not polite to describe a fellow officer as ‘an idiot’. However, I recall yesterday’s diner conversation between two of these ‘idiots’. I decide that objecting to Dave’s terminology might not be entirely appropriate and would mainly damage my own credibility. ‘I was informed by the colonel that British Army officers can be employed anywhere after only a short briefing,’ I say. Like the colonel, I emphasize ‘British’ and ‘Army’. ‘You didn’t explain that we are in the middle of a war here and that we are trying to keep an operation going? That flying may be more important than a TO during which the VIPs can tell each other how wonderful they all are?’ Dave says, while giving me a penetrating look. A choked sound comes from where William sits. When I turn around, I see him trying to suppress a snigger. ‘This is fairly typical,’ William says with understatement. In the next few days I will quickly find out how ‘typical’. The Friday morning after becoming acquainted with the colonel, I sleep in as I always do on Friday and Sunday mornings. When I get up, I mop the floor of my bedroom (which mainly results in the water in the bucket turning black) and send some private emails before I leave for the office at noon. As soon as I walk onto the metal outer stairs, a corporal hurries towards me. ‘The colonel has been looking for you all morning. He urgently wishes to see you’, he pants. This time the knocking on the door is immediately followed by an ‘enter!’ Last time I felt that the colonel’s face spelled trouble, now it looks like he is on the verge of exploding. ‘In my room, enjoying a well-earned morning off, as usual on Friday mornings,’ I say in a somewhat more irritated tone than I had intended. For a moment I don’t know what to say. The air transport desk is always manned. The warrant officers take care of that themselves, I never need to get involved and no warrant officer being available has never happened before. Until now, the two warrant officers have been the epitome of professionalism and have been totally committed to their jobs. ‘I don’t know,’ I say truthfully. Gee, he actually listened during our previous conversation. I fight off the urge to remark ‘But weren’t there enough British Army officers to take over?’ as exploding colonels probably cause a lot of trouble. This thought, however, suddenly makes me realise what is happening here. I stick to ‘I will make sure it will not happen again’, followed by ‘as long as I am Chief.’ Finally, I add ‘colonel’ to this stuttered sentence. I expect a ‘get out!’, but the colonel only turns his back to me to stare out of the window and I walk out of the room without saying anything further. When, half an hour later, the two warrant officers enter the office with the innocent attitude of two kids who have just raided the biscuit jar, I close the door for the second time this week. I waste no time asking where they have been and adopt my best mum-is-angry face. ‘You do realize, I hope, that this can be construed as mutiny?’ I open. ‘It is Friday morning; the two of us have just been to the bazaar, like everybody else on the compound. It is low-ops day, ma’am,’ Dave says. It stays quiet for a long time. Dave and Aurelio look at each other and I have the impression that Aurelio gives Dave a short nod, although that could have been a trick of the eye. ‘Was there a problem? Something the Army officers couldn’t solve, ma’am?’ Dave asks innocently. Dave is a very talented soldier, but a second career as an actor is not on the cards for him. He is not the only one, because I feel the start of a smile enter my mum-is-angry face. Just what I thought! ‘Did one of my warrant officers brief the British Army officers?’ I ask. Both of them shake their heads, without saying anything and I see Dave suddenly pout his lips. My starting smile is immediately under control when I realise the crucial mistake the gentlemen have made. Dave clasps his belt and I think I hear a very soft ‘damned’. ‘I’m not interested. The colonel says it was the whole morning’. Clearly, the ground underneath Aurelio’s feet is rather interesting, so is the view from the window behind me for Dave. ‘From day one I have told you that when things go wrong, I will take the blame, without any objection. That’s what I am Chief for. Have I ever not done that?’ It’s a rhetorical question, as I know that this is something they find surprising. Apparently, it is something not every chief does. They actually look guilty and my angry face is real now. ‘I have also said from day one that in exchange I expect you to inform me of potential problems and exceptional decisions you take so that I know what to bend over for.’ Both men nod. Both gentlemen give a relieved nod, followed by a rather bashful ‘Yes, ma’am’. Although I am now genuinely angry, I also have to laugh at the absurd situation. Here I am, cryptically telling off two older men, one of whom is old enough to be my father, but we understand each other perfectly. ‘How many people will the new COMISAF travel with during his key leader engagement? His aid-de-camp, some force protection people, maybe a press officer and a staff officer?’ I ask after some small talk. I decide to consult with my pillow on how to tell COMISAF that ITAS and key leader engagement from the air are not compatible. It is silent for a moment and I can see the colonel’s mouth distort. ‘For the next two weeks,’ he then says. ‘The next two weeks,’ I agree. ‘Don’t worry, that’s normal with him,’ he says. ‘How do you deal with that?’ I ask. ‘You skip rank?’ Escalating is something which normally happens only out of dire necessity. ‘Would the British be willing to provide those?’ I ask William. From the corner of my eye, I can see Dave vehemently shake his head. ‘She is Dutch,’ Aurelio says, ‘she doesn’t have to worry about her career, only about the mission.’ My standard answer when the Italians expressed worries about my career prospects when I made a decision, has clearly sunk in. We never discuss it again. Neither do the colonel and I: we try our best to avoid each other in the remaining two weeks, both glad that I will leave. 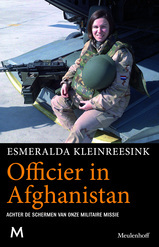 You have read a translated chapter from ‘Officier in Afghanistan’ by Esmeralda Kleinreesink. Interested in acquiring the foreign rights? Please contact Dutch publisher Meulenhoff. A pdf version of this text can be downloaded. Please feel free to distribute this pdf version, as long as no changes to the text are made.